The new trailer for The Walking Dead season nine B just dropped and, in full disclosure, it’s not for the faint of heart. Or, perhaps more to the point, for the faint of stomach. We recommend risking your gag reflex being triggered, though, because the promo gives a (deeply unsettling) first look at new big bad Alpha. Played by Fantastic Beasts star Samantha Morton, Alpha was first introduced during the first half of season nine — but only in key art. Fans knew she would at some point emerge as the leader of the Whisperers, a group that was initially believed to be walkers that had evolved to be able to speak and hunt. Of course, the final few moments of the mid-season finale revealed the truth: the Whisperers are humans who wear walker skin as camouflage. Which brings us to the new, incredibly creepy teaser trailer for the back half of the season. In the clip, we see — and can’t unsee — exactly what it looks like when Alpha creates her Whisperer mask. Peeling the skin off a corpse. Stretching it and sewing seams (bleeeeccchh) to make the skin-mask tight. And, finally, sliding it on over her face. As if those actions weren’t enough to give you goosebumps, a foreboding song plays in the background, singing, “Whisper, whisper, whisper in the garden” in hushed, warped tones. You didn’t actually need to sleep tonight, did you? It goes without saying that fans have a lot of questions that need to be answered in the back half of the season about Alpha and the Whisperers. They go hand in hand with the many unexplained details still looming from the six-year time jump that occurred at the end of season six. In an interview with Access (via We Got This Covered), TWD star Tom Payne — who played Jesus, the first primary survivor to (spoiler alert!) 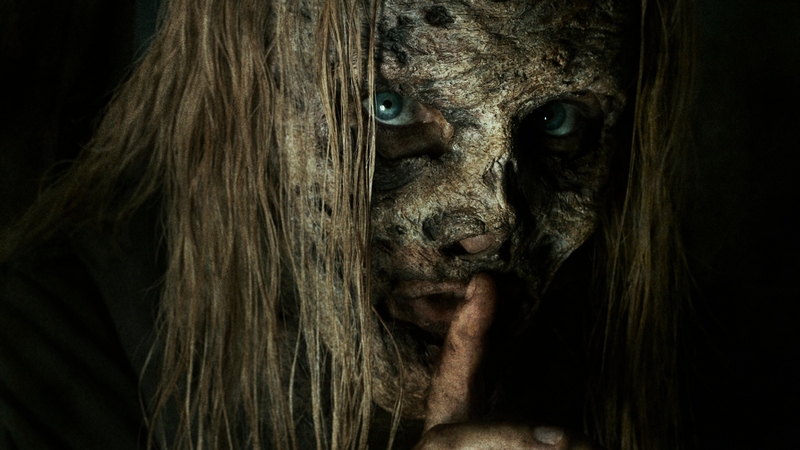 fall prey to the Whisperers — hinted that perhaps one of the show’s remaining episodes could address any lingering quandaries. The Walking Dead returns with season nine B on Feb. 10 at 9/8c on AMC.